Last week, Melissa discussed the use of aspirin as a preventative measure against colorectal cancer. While the risks may outweigh the benefits for the general population, aspirin may be a useful treatment in specific populations (e.g., those with high levels of HPGD). So, if you knew that you had high HPGD, would you take more aspirin? Or if you have already been diagnosed with cancer—a particularly aggressive form—would you be willing to take a more potent drug? Ann Marie Rogers, a middle-aged woman living in Swindon, England, had HER2-positive breast cancer. HER2+ tumors spread rapidly and almost uncontrollably. But in 2005, when Ann Marie found out that her cancer was HER2+, clinical trials for Herceptin (aka trastuzumab) were showing promising results in HER2+ cancer patients—with a significantly reduced rate of relapse rate when given with or after chemotherapy1. Herceptin is a HER2 monoclonal antibody that was not yet available to patients—except in exceptional circumstance—through the English National Health Service (NHS). Still in the early stages of investigation, Herceptin was lauded as a potential “cure” for cancer2. Thus, several cancer charities urged for the drug to be made available to all eligible patients in England, covered by the NHS. At the same time, however, it was known that Herceptin—already monetarily costly—could also increase the risk of heart failure, and an article in the Lancet3 warned against too readily accepting the benefits of the drug without considering its risks. Rogers, unwilling to yield to her cancer, weighed her options and decided that the risks and high cost of the drug were worth the potential reward. Unfortunately, the drug was only provided by the NHS on a case-by-case basis, and the Swindon NHS Primary Care Trusts (PCT) refused to pay for her treatment. So, she took out a loan to cover the cost. The first two treatments alone cost her £1,950 (over $3,000), and she could not pay for a third treatment. Herceptin’s proposed mechanism of action (from Genentech). Instead, she sued the Swindon PCT to make Herceptin available for all eligible patients. Although she lost in the High Court, she won at the Court of Appeal (you can read final judgment here). The approval for the use of Herceptin was expedited by Rogers’s case, and she was provided treatment until her death in 2009. Rogers has been praised for her efforts in expediting the availability of drugs like Herceptin. Would you have done the same? These types of cases occur all the time (recently, in the highly publicized case of Andrea Sloan), and I am still not sure how to feel about the compassionate use of investigational drugs. This is not a bioethics blog, and I am not a cancer biologist, but the story of Ann Marie Rogers led me to HER2 this week, and I wanted to remind you (and myself) of the personal side of biology. As addressed in previous Gene-of-the-Week posts, the genes that are dysregulated in cancers are also important for healthy development. So treatments against the proteins they encode are likely to have negative side-effects unless they are highly specific. So how can we increase specificity of HER2-targeting drugs? Is HER2 even the right target? HER2 is another gene with many names; it is sometimes called ErbB2 or Neu. In this section, I’m going to change things up (to be consistent with the literature) and will refer to HER2 as ErbB2. 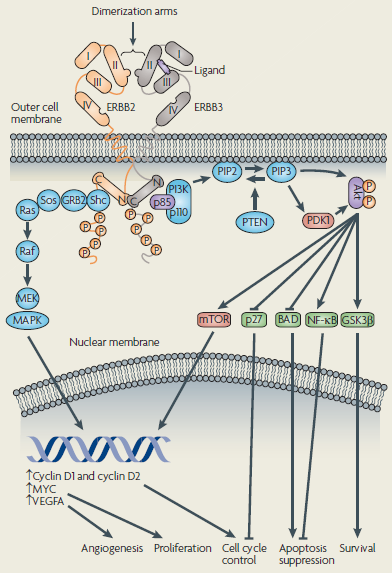 ErbB2 is a member of an unusual family of transmembrane tyrosine kinase receptors, including EGFR/HER1, ErbB3/HER3, and ErbB4/HER4. These proteins are usually inactive monomers, but ligand binding initiates dimerization with each other4. EGFR, ErbB3, and ErbB4 bind multiple growth factors (Figure 1), but no soluble ligands for ErbB2 have been found (although Drosophila research suggests that membrane-associated ligands have yet to be found5). Once a ligand has bound one of the other EGFRs, ErbB2 may be recruited to form a heterodimer through which it can act. Figure 1. EGFRs and their ligands. From Lemmon, et al. (2014). Mice bred without ErbB2 are embryonic lethal, meaning they die before they are born. They have both neurodevelopmental and cardiac defects. As suggested by the Herceptin case, these proteins are also important for maintaining cardiac function in adults, not just during development6, so disrupting them is risky. Is there a way around this risk? 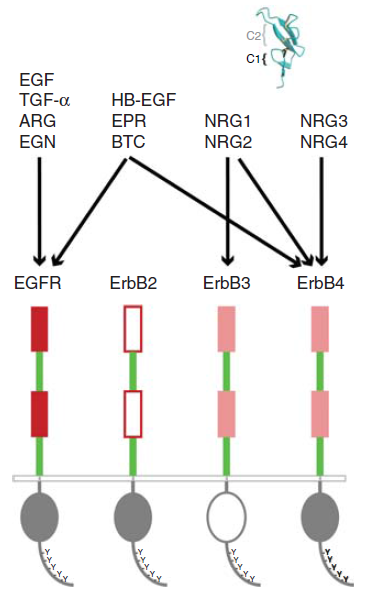 Unlike EGFR and ErbB4, ErbB2 and ErbB3 cannot form homodimers. But it turns out ErbB2 and ErbB3 are the perfect match to heterodimerize together. While ErbB2 cannot bind ligands, ErbB3 lacks intrinsic tyrosine kinase activity (typical of the other EGFRs). Once they are together, they can initiate the MAPK pathway, which stimulates cell proliferation, or the PI3K-Akt pathway, which promotes cell survival and cell adhesion (Figure 2). In the case of HER2+ cancers, it is the ErbB2-ErbB3 dimer that causes the rapid spread of tumors. Therefore, the ErbB2-ErbB3 heterodimer, not ErbB2 alone, is a more promising and potentially less-damaging target for HER2+ cancers7. Or maybe targets further downstream would be less damaging, but would they inhibit enough? It’s so complicated!!! Figure 2. Downstream targets of the ErbB2-ErbB3 dimer. From Baselga & Swain (2009).